Does Spike Lee need Ritalin? Looking back at his career, you have to wonder if he has a need to draw your attention to… well, whatever takes his fancy. In each of his films, there is a blatant need to signpost a problem or an obvious fact, or at least to sear some unforgettable images in the back of your mind. It’s unlikely a jheri-curled John Turturro qualifies as such an image. However, said wig (only the second-best haircut of Turturro’s career after Barton Fink) is just one highlight in Lee’s 1995 crime drama Clockers. Turturro and Harvey Keitel play Detectives Mazilli and Klein, who are investigating the shooting of the owner of a burger joint. A ‘hood named Victor (Isaiah Washington) confesses, but the evidence points to his younger brother, ‘Strike’ (Mekhi Phifer). While Keitel’s Klein pressures Strike for more information, he is also under pressure from his mentor, gang boss Rodney Little (Delroy Lindo) to keep tight-lipped. For a director whose subtlety is virtually non-existent, Lee exercises notable visual restraint in Clockers. DP Malik Hassan Sayeed uses a bright palette with a lot of natural light, and any directorial flourishes do not bleed into the production design; no garish outfits or neon-lit clubs here, no sir! However, there is a trade-off; instead of a garish look, we get a surprisingly clichéd gang story (courtesy of Lee and Richard Price, author of the source novel), complete with central conflicted hero. To top it off, Strike suffers from intestinal ulcers, which eventually result in him being hospitalised. A metaphor, you say? 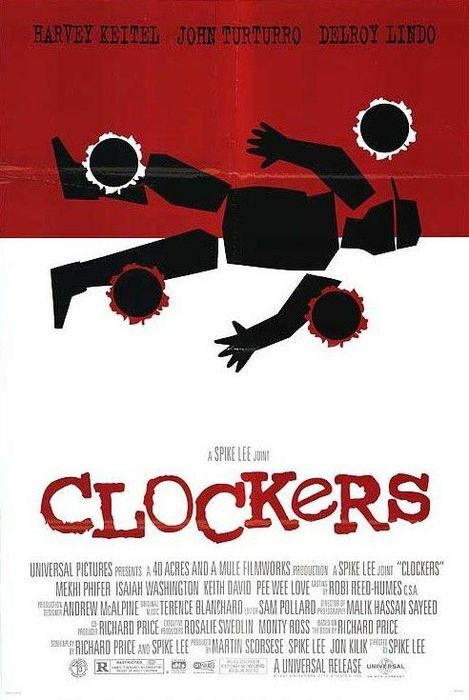 Clockers is very much aware of the time in which its set (Giuliani was recently elected at the time of shooting), and Lee’s love of NY is clear in how it is represented in the form of Strike, but it’s still a heavy-handed and preachy plot device. That said, Phifer is utterly magnetic as Strike; the stress of his situation is palpable, and is aided by solid support from Keitel and Lindo (incidentally, Keitel and John Tuturro were billed ahead of Phifer on the poster. Is it cos he is black? Lee’s probably pondered that one…). Clockers is a film of its time; relevant then, barely scraping by now on a clichéd tale and excellent performances. Lee will never be stale, but he needs to strive for deeper relevance lest his own repertoire should suffer that fate. It is easy to forget, in the post-No Country For Old Men haze, that there was a time when the Coen brothers weren’t the toast of the Academy. They were once a pair of outsiders looking in; they were armed with a surrealist eye, a quick wit and a healthy disdain for the Hollywood process. That disdain was best expressed in their 1991 Palme d’Or winner Barton Fink, a wonderful curio which looks and feels like a kitschy little flick before dovetailing into unexpectedly dark terrain. The Coen’s cynicism is embodied in the idealist pile of neuroses that is the character of Barton Fink (John Tuturro), a playwright who is the hottest thing on the NY stage scene. Fink seeks to create a ‘theatre of the proletariat’, but that idealism is about to be swamped by an offer from a Hollywood studio to write a wrestling picture. Fink is a substitute for the Coens, as evidenced by his constant worry and the fact that (refreshingly) he does not allow himself to be corrupted by Jack Lipnick (Michael Lerner), the over-enthusiastic head of Capitol Pictures, an amalgam/pastiche of Selznick and Weinstein. The Coens doubtlessly had a lot of experiences to infuse in the character of Fink, and Tuturro makes for a likeably worried mensch. He’s surrounded by an esoteric ensemble, including Lerner (energetic), John Goodman (perky), Judy Davis (rigid) and John Mahoney (drunk). 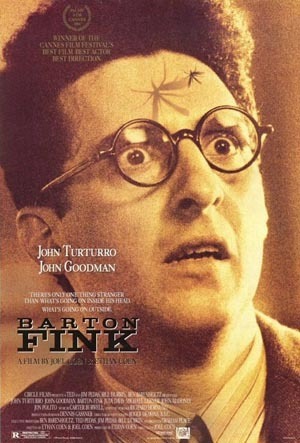 Events barrel along until about the halfway point, when Barton Fink takes an eerie and bloody turn. As the tale of the everyman writer turns into a murder mystery, the events become more compelling and bizarre. The Coens have created the epitome of the writer in Fink, a bemused observer of events to be potentially filtered into art. In this example, he’s just getting a little too close to the action. The action really comes in this darker second half, meaning the first half of the film is a little too slow-burn, but it allows us time to wallow in the beautiful version of 1940s LA the Coens present. Barton’s hotel is a vaguely creepy art deco nightmare, whilst DP Roger Deakins shines the California sunshine constantly and brightly. Barton Fink refuses to conform; it starts happily, slowly and easy to digest. Then, once the viewer is settled, it morphs into darkness and true cynicism. Expect no easy answers, no compromises and no lack of narrative and thematic meat to chew on. Expect the Coens at their most Coen-esque.